This post is brought to you by Visit Santa Maria Valley, which provided advertising support. Ever since butchers Larry Viegas and Bob Schutz grilled the first tri-tip in the meat department of a Safeway store on the corner of Mill and Vine Streets in Santa Maria, California in 1952, the Santa Maria Valley has been one of America’s best kept barbecue secrets. California’s favorite barbecued beef, the tri-tip—the triangular tip of the sirloin—combines the smoke flavor of true slow-cooked barbecue with the sanguine succulence of steak. Today, tri-tip or top sirloin are found throughout central California—indeed, when Santa Marians, many Santa Barbarans, and even Angelinos speak of barbecue, tri-tip or top sirloin are frequently what they mean. The first barbecues began in the mid-nineteenth century as communal feasts, where ranchers fed large crowds of ranch hands and farmers. Early black-and-white photographs in the Santa Maria Valley’s historical archives show huge pits fueled with blazing wood. The meat—a flavorful loin cut called top block sirloin—was skewered on long steel rods and spit roasted over the open fire. The seasonings were kept simple—salt, pepper, garlic powder or garlic salt—to keep the emphasis on the taste of the meat. In time, the accompaniments came to include a distinctive, small, pink bean indigenous to the region—the pinquito. Stewed with tomatoes, onions, and spices, it became the Santa Maria Valley version of baked beans (the dish is considerably less sweet). A Mexican influence can be seen in the salsa traditionally served with Santa Maria-style barbecue, while the obligatory accompanying green salad and grilled garlic bread are pure California. When I first visited the area 15 years ago, the main drag of Santa Maria, on a weekend in barbecue season (late spring and early summer) held dozens of pit masters serving up freshly grilled tri-tip. They arrived early, towing the local version of a barbecue pit—a giant black metal box with an adjustable grate you raise and lower with the turn of a crank or tug on a pulley. These giant grills are part of what distinguish barbecues in the Santa Maria Valley from the heavily smoked meats found elsewhere on the American barbecue trail. The fuel, local red oak, is the second distinguishing feature of Santa Maria–style barbecue. Don’t expect the heavy smoke flavor associated with the barbecue of the American South. No, the open pits impart a light, delicately aromatic wood flavor that’s now synonymous with California grilling. Today, the Santa Maria–style barbecue tradition is alive and well as top block sirloin continues to be grilled at restaurants and community barbecues staged by fraternal organizations. I recommend traveling to the region for a taste at the source. And if my word’s not enough to motivate a visit, Andrew Zimmern’s Bizarre Foods also recently covered the area, with a segment on the Santa Maria Elks Lodge. You can find a helpful list of current restaurants on SantaMariaValley.com while planning your trip. 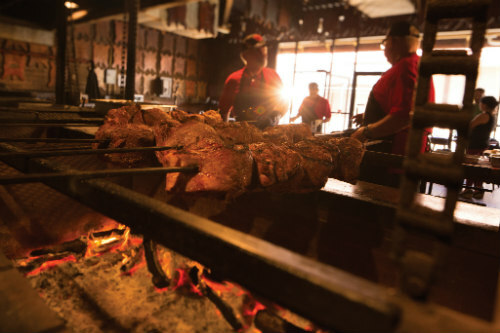 The best way to sample Santa Maria–style barbecue is to stop wherever you see smoke. Traveling to the region? 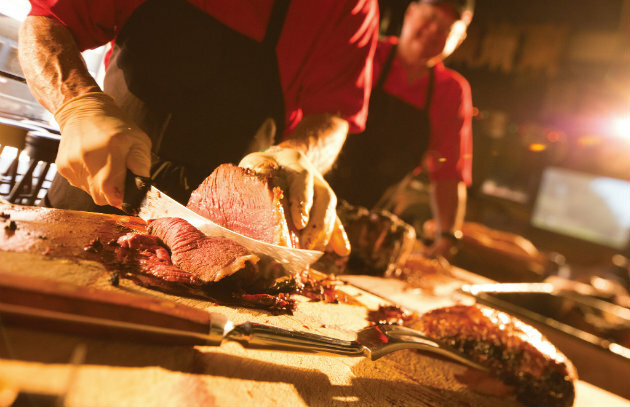 Share your impressions of Santa Maria–style Barbecue with us on Twitter, Facebook, and the Barbecue Board.